As a Sedona wedding officiant, I most often officiate weddings outdoors, since it’s so beautiful here. Perhaps my favorite outdoor wedding this summer was Risa and Greg’s, since they asked me to officiate their wedding IN Oak Creek. 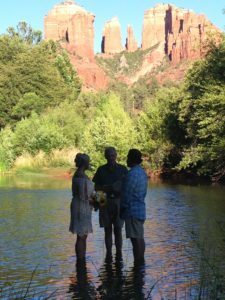 The groom and I were both wearing shorts, and we stood barefoot in the creek, in the shadow of Cathedral Rock. It was quite hot that day, but we were cool as the proverbial cucumbers! That spot, at Crescent Moon Ranch Park (aka Red Rock Crossing) is called the reflecting pool, since it’s the best spot to catch a reflection of Cathedral Rock in the water. Often it’s crowded with photographers, since Cathedral Rock is the most-photographed natural feature in all of Arizona, but that evening, we had it completely to ourselves. Travis, one of the employees at the park, was kind enough to act as a witness, and also to take these pictures. The other witness was a visitor from England — from Poole, a lovely seaside ton in Dorset. 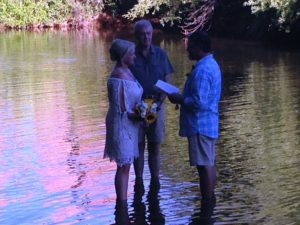 All I can say is that being a Sedona wedding officiant is an awesome job!